As Minnesota's Road Funding Dries Up, State Agencies Face Dilemma: Patch or Redo? 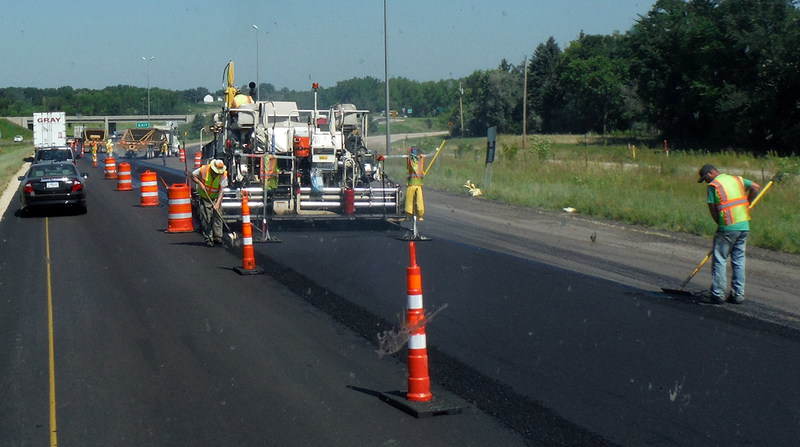 The joints had been fixed and fresh asphalt laid over 40-year-old concrete on Interstate 94 between downtown Minneapolis and Brooklyn Center. But before traffic even started to roll over the new multimillion-dollar freeway, the pavement buckled in five places from the 90-degree June heat, leading to higher costs and more delays. The incident highlights a wrenching debate that is playing out among state officials trying to stretch limited transportation money to fix or replace as much roadway as possible. In Minnesota and in many other states, transportation funding has lagged as road conditions have deteriorated. “We are undercapitalized,” said Minnesota Department of Transportation Commissioner Charlie Zelle. He has said the state is in “patching mode” because of the funding shortfall. In fact, Minnesota is facing a $2.8 billion transportation shortfall over the next four years, according to TRIP, a national transportation research group. The Legislature this year authorized $600 million in new funding for roads and bridges. The national report said 44% of major metro-area roads are in poor or mediocre condition due to lack of funding. Roads in poor condition are projected to increase from 535 miles to 963 miles by 2020. The report also said MnDOT needs $1.8 billion to $2.5 billion to move forward with projects to reduce congestion and improve traffic safety. In many cases, the debate comes down to this: an asphalt patch or a concrete overhaul. Zelle said he’d like to redo I-94 and other heavily traveled roads with concrete. But the decision to patch joints and cover concrete with asphalt is a matter of time and resources. The asphalt overlay on I-94 will last as long as a full concrete rehab, he said. Matt Zeller, executive director of the Concrete Paving Association of Minnesota and a former MnDOT employee, has a problem with the state’s “Band-Aid” approach to fixing its highways. Instead of ripping out old concrete and laying new -- a costly proposition, Zeller acknowledges, but one that would last another 30 to 40 years -- the state routinely has covered up its aging concrete with asphalt, which is cheaper but likely to last only 12 to 15 years. Asphalt is a feasible and economical solution, even if it means going back and doing the work sooner than if new concrete were put down, said Adeel Lari, a research fellow at the University of Minnesota’s Humphrey School of Public Affairs and a former senior manager at MnDOT. To rebuild I-94, the agency would need $1 billion, or the cost of a Vikings stadium, MnDOT’s Zelle said. He acknowledges that by opting for the patching and reconstruction in bits and spurts, motorists likely will experience construction some place on the metro area’s I-94 corridor annually for the next 15 years. MnDOT resurfaces I-94 between the downtowns of St. Paul and Minneapolis about every seven years. The Paving Association’s Zeller points to other projects where MnDOT has taken the asphalt “Band-Aid” approach, only to be back redoing the work sooner than planned. In the 1990s, MnDOT applied asphalt over concrete on I-394 after neighbors complained about the whine created by the concrete pavement. The asphalt began to break apart a decade later, exposing chunks of concrete. MnDOT applied another thin layer of asphalt in the 2000s. Two years ago, when I-394 was rife with potholes and divots, the agency stripped off the asphalt, dug out deteriorating joints, replaced them and shored up the concrete around them. The agency then smoothed out the surface using a process called diamond grinding. MnDOT’s Zelle called it “the best road in the state” and a freeway that won’t need major attention for another 25 years. Aside from building a new freeway from scratch, a better solution, the Paving Association’s Zeller said, would have been for MnDOT to do a concrete overlay, meaning placing new concrete over the existing concrete. That would provide structural integrity for years to come, he said. With the I-94 issues last month, MnDOT sent the contractor back to make fixes to the road it had just repaired. MnDOT pavement engineer Tim Clyne said concrete bubbled up June 3 and June 4 in at least five locations between 26th Avenue North and West Broadway — two on the westbound side and three on the eastbound side. Contractor PCi Roads had to grind out the distressed concrete below the surface that caused the problems and then patch the 9-inch holes with asphalt, not concrete. Road buckles occur most often at joints in concrete that are old and weak. Project manager Tim Nelson said that the asphalt made the pavement hotter and contributed to the blowups, but that once traffic returned, it helped to keep it cooler, lessening the chances of more buckles on the newly paved lanes. As work proceeds on I-94, will the freeway continue to buckle?